Our dear friend’s daughter is getting married. They are Amish. The Amish typically get married in October and November on either a Tuesday or Thursday. I have to admit that I was just a little surprised by the invitation. Yes, for their privacy and so no one yells at me, I covered up their names. But don’t you think it is a little odd that they put a photograph (being that they don’t like photos of themselves) of English kids dressed up on the invitation? I never would have thought that they would do that. 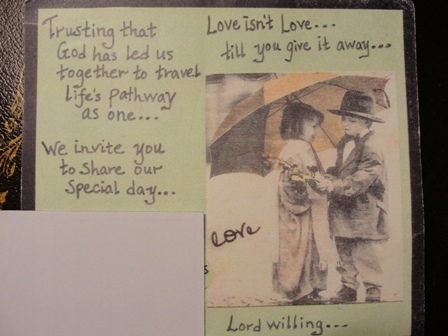 Not that I had ever seen an Amish wedding invitation before and if they read this, won’t likely ever see another either. Anyway, I offered to provide the tablecloths for the wedding. 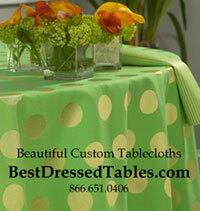 They normally use plastic tablecloths – two words that should never be used in the same sentence. They have to feed a lot of people and only have limited space and tables ( 3 church benches are put up on wooden legs to make a table and then more benches are used for the seats). So they feed people in shiftsand they roll out paper towels down then length of each side of the table and when the first group is finished they toss out those paper towel runners and put down new ones. Very clever! We are still doing the paper towels thing but we are using cloth tablecloths. There was some discussion between the three generations of women about the color: ivory, white or sage and sage was nixed as being too fancy. The mother of the bride it turns out is like any MOB. I had to bring over the napkins for the bridal party early and she wanted to do a test run on the tablecloths. Good thing we did that because “our people” like the tablecloths to go to the floor and “their people” do not, as there is too much getting up and down and they don’t want to get caught in all that fabric. The MOB had all the boys putting a new ceiling in the shedas that was going to be the cook tent and everyone was power washing, pruning and sweeping last Saturday and the wedding is still several weeks away! MOBs are all the same, because when the whole wedding thing takes over all the cultural differences evaporate and the MOB status rules above all else.